The manure our horses leave behind in the pasture is a two-edged sword. Used wisely with the investment of just a little work, it builds the soil with valuable humus and fertilizes the grass, yielding ever more lush pasture with time. But ignored and left to lay, each pasture-patty suffocates the grass beneath it and poisons the grass around it with too much nitrogen in too small a space, resulting in an ever-growing collection of bare brown spots in your pasture. Nowadays, most of us can't afford to lose any productive pasture, so the choice seems obvious: invest a little effort in managing your field manure, and reap the rewards. In a previous Tip I discussed managing barn manure with the aid of composting bins, but field manure is another matter. For us (and, I suspect, for most everyone), cleaning up acres of pasture frequently by hand with a manure fork and cart, and hauling that manure back to the barn to be composted, is just too much like work, and so it just doesn't get done. The sensible alternative (at least for those of us fortunate enough to own tractors) is to process field manure in place, by dragging it with a harrow rake. Dragging your manure breaks up the piles and spreads them across a wide area, preventing them from suffocating or burning the grass. It also enables the manure to dry thoroughly in the sun, killing any parasite eggs it may contain. 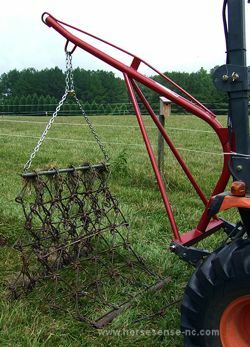 A harrow rake looks like a length of extremely heavy chain link fence, with short steel tines projecting from one side (see Figure 1). Hitched to the back of your tractor, it is used to drag your fields for many purposes, including breaking up thatch and (our topic here) dragging manure. Flipped tines-up (so that its smooth face runs along the ground) it is also ideal for dragging arenas and round pens to keep the footing smooth and level and weed-free. Handy and inexpensive as a harrow rake is, I'm always surprised by the number of horse owners who don't own one (or who, if they do, don't actually use it). I suspect this is because most folks don't know how to work with one correctly. Handled wrong, a harrow rake is a pure hassle...it weighs well in excess of 150 pounds and it is floppy, so it is almost impossible to pick up and move by hand. And if you haven't learned the trick, then getting it from where you store it to where you want to use it usually means ripping up lawns and walks dragging it behind your tractor — not good. The trick is to always team up a harrow rake with another handy and inexpensive implement, a hitch boom (see Figures 1 and 2). Attached to the three-point hitch on the back of your tractor and chained to your harrow rake, it allows you to lift the rake off the ground when you want to travel, and to lower it onto the ground when you want to drag with it. Figure 1. A harrow rake (shown here tines down) drags behind your tractor to break up and spread manure piles. 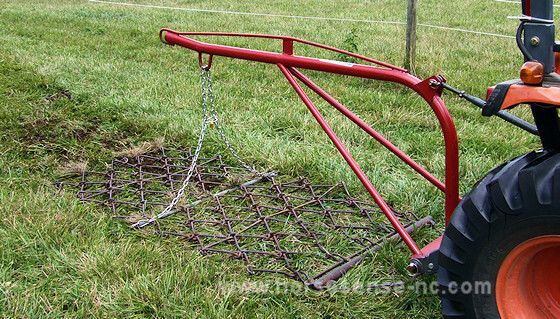 The red hitch boom above it, attached to the tractor's three-point hitch and connected to the harrow rake with a length of chain, allows you to lift the harrow rake off the ground when you need to travel without dragging (as in Figure 2, below). I attach the chain to the harrow rake by slipping a length of iron pipe through the rake's links at about its mid-point. An eye-bolt in each end of the pipe receives a carabiner on the corresponding end of the chain, making connection and disconnection quick and easy. Figure 2. Raising the hitch boom via your three-point hitch enables you to travel without dragging. Drive from pile to pile in your pasture with the boom raised, then lower it to drag each pile. When it's time to take the harrow rake off the tractor and store it, use the following trick to handle this heavy, floppy implement with ease. With the rake spread out flat on the ground, place a six-foot length of fence post on top of it at one end and simply roll the harrow rake onto the post, like a roll of toilet paper on its cardboard tube (Figure 3). Rolled up like this, two people (one at each end) can easily lift and carry the harrow rake, or one person alone can quite easily roll it into the tractor's front-loader bucket to move it around. Never leave your rake spread out flat on the ground for any significant period of time; grass and weeds will quickly hide it, and sooner or later an unwary horse (or a person either afoot or driving a mower) will discover it the hard way, usually with disasterous results. Figure 3. A harrow rake is easy to handle when it is rolled up onto a length of fence post or even just a 2x4. Here, the orange clevis (normally used to attach the rake to the tractor) attaches the free end of the harrow to itself, to prevent it from unrolling.